This is a classic example of expired film not performing well. The reason I photographed this hydro control station is because the area in shadow has very slightly jarring messages when compared to the part that is in light. They can’t be made clear with this crappy film, but you can just make out the dire warnings like Danger Keep Out and some human actions with a red circle and line over top. 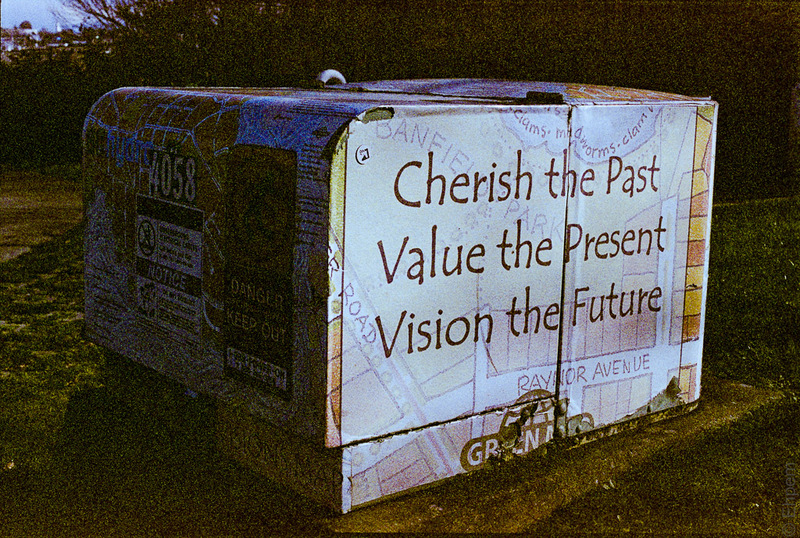 Cherish, Value, Vision seem a bit at odds, in tone at least, with Danger, Out, Don’t. But maybe that is just me. Nice juxtaposition of messages. I’d be disappointed in the quality of the shots, too. happy Easter Mr E! Hi Kate. That shot was disappointing, but there is another on that roll (http://wp.me/s1R4lY-tender) which is one of my favourite shots from the past few years. It all depends on the subject I guess. Oh, yes. I LOVE that shot! Yes, depends on so much with film photography. Hope you meet that deadline! Me too. Its a tight thing but I think it will be ok.
Those nine words will do for me – they say it all. Hi Andy – they are good words, though as someone that worked in government for a couple of decades the word ‘vision’ has been ruined for me, being redolent of time wasting meetings about “strategic visioning for the future”. I’ve left that job and am slowly reclaiming the normal meanings of words, but some still jump at me, as if going for the throat. Yes, one becomes very cynical of the workings of government departments. I worked in the NHS for forty years. The film might be crappy but the message on the front side of the structure gets you thinking! Thanks Αντρέας, it does get you thinking and that is kind of nice for an object just sitting on the boulevard. They used all to be military green or faded pastel blue, but many are decorated now. It suppresses graffiti I think, so the motives might be pecuniary, but the effect is more than that.